See the backstory- read along & draw with the illustrators! 25 authors & illustrators will be signing Sept. 14th! Creating books in Clay-followed by a clay craft! Poppy's Best Babies- Launch Party! 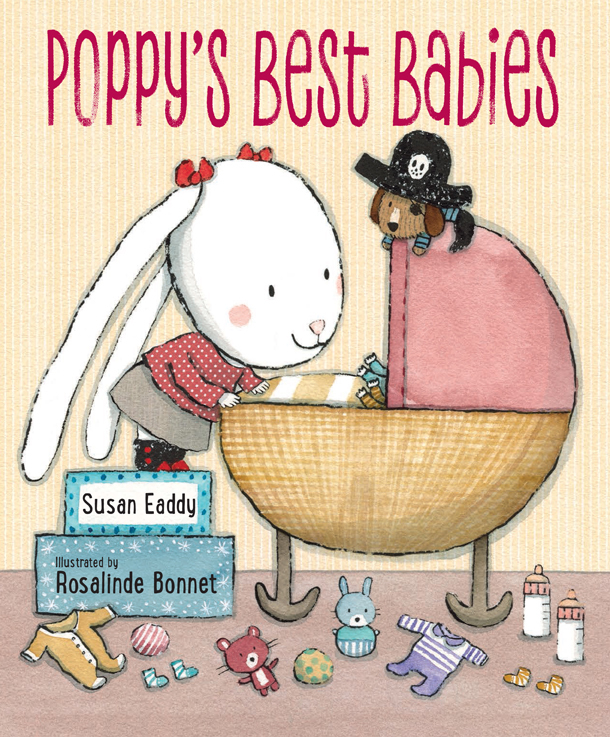 Join us at Parnassus Books Sunday May 20th to launch Poppy's Best Babies. There will be kazoos to make and a Poppy cake! Play this Book and Pet this Book! Poppy’s Best Paper was inspired by the author’s own 4th grade paper. But rejections rolled in when Poppy started life as a blue raccoon made of clay. Join us as we learn about one author/illustrator’s roller coaster path to publication & the results of perseverance. When should you step back and allow someone else to put pictures to your words? You have worked for years to draw/create the characters in your own text in just the right way. How do you handle it when an editor or agent suggests that someone other than you should illustrate the book you have written? Using the example of Susan Eaddy’s book, Poppy Best Paper, we explore this scenario in detail. This session will give writers and illustrators a glimpse of the editorial process that books undergo prior to publication. How do pacing & composition contribute to expanding the story told with pictures? This visual presentation explores well-known picture books and breaks down the reasons that some work exceptionally well. Join us as we discover what is behind the best books that have persisted through the ages. Clay Illustrator Susan Eaddy takes you through the steps in creating one of her books, from start to finish. She shows her process of creating storyboards, sketches, making palette choices and working collaboratively with an Art Director. Whether you work digitally or traditionally, these insights will be helpful for anyone who wants to know more about illustrating books for children. For authors, this look at the steps an illustrator follows in the creation of a picture book will enable you to approach your next project with deeper insights into how illustrations and words work together to tell the strongest stories. Mistakes & Detours, Try Try Again! Children's books offer some of the best reading material around. Have you ever dreamed of writing and publishing one? Or maybe you're an artist interested in illustration. Would you like to meet people who share your passion? If so, join us on January 20, 10:00 AM, at the Huntsville-Madison County downtown library auditorium as the Southern Breeze chapter of the Society of Children's Book Writers and Illustrators presents a workshop titled "Mistakes and Detours--Try, Try Again!" Susan Eaddy, children's book author and illustrator, will tell you about her roller coaster path to publication and the importance of perseverance. Also, we will have an informal critique session, so bring a few pages of your own work. Call 256-772-3433 for more information on this informative workshop on writing for children. We'll see you at 10:00 AM, Saturday, January 20, at the downtown library auditorium. Come join the SCBWI Autograph Party and help us kick off the Fall Conference! I'm delighted to be part of a Children's Book Panel at this first Mississippi Book Festival in Jackson MS. more details later! Come join us at Parnassus Books in Nashville TN to launch Poppy into the BIG world! July 7th Poppy's Best Paper Book Release Date! Presentation and book signing at The Young Author's Conference. Meet the authors all day long! Clay Illustrator Susan Eaddy tells the story of her unusual collaboration with author Julie Hedlund from their first meeting in Bologna Italy, all the way through the funding of this dream book project with a successful Kickstarter campaign. She’ll reveal what they learned with all of the mistakes and glory, and show the birth of My Love for You is the Sun from start to finish. Excited to speak with 3rd graders downunder!